Fourth graders from the Stephen F. Austin State University Charter School participated in a hands-on activity Friday when they visited SFA's anthropology lab. 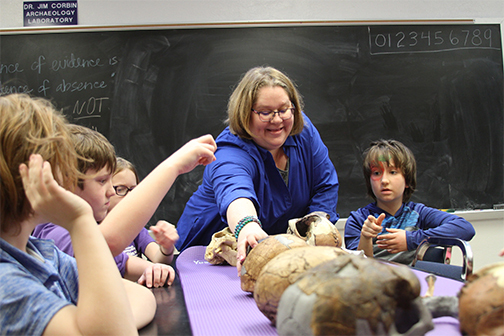 During the activity, Dr. Karol Chandler-Ezell, SFA associate professor of anthropology, discussed the differences between prehistoric and modern human bone structure using skeletal replicas. In addition, the students viewed a film about the lives of Native Americans, which they are studying in their Texas history class in preparation for Native American Heritage Month in November. Chandler-Ezell said that the connection between the university and the charter school allows these students to have access to resources and learning experiences at a young age.